I didn't remember being especially enthralled by these two episodes the first time through. They have some seriously over the top silly moments, and at least one thing I found problematic. Even so, the second watching of two episodes that wouldn't rank anywhere in my favorites lists had enough bits of joy to rank a full post. 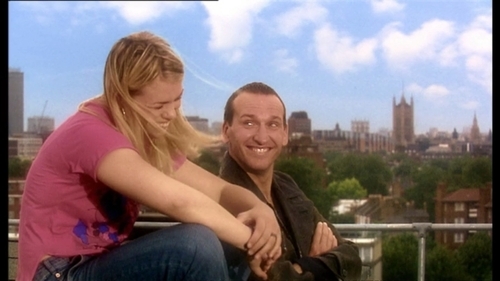 Especially now that my "first watchings" are into the second season and I'm desperately missing Nine. Oh, he totally deserved it. Rose's poor mother was a basket case, worrying about her. I am old enough now to feel empathy for Jackie. We raise our children and hope that they will be safe and happy. Oh, why can't her daughter be happy AND safe? Will she ever be able to accept that Rose's world is so immense now that the idea of stepping away from the Doctor is beyond incomprehensible? Will the Doctor be able to handle the possibility of losing Rose? The look on his face as Jackie asks, "Is she safe?" makes it clear that she has become his touchstone. The moment he looked at Rose and said, "I could save the world and lose you..." broke my heart. It's clear that he wants to do anything to save her, but sometimes saving the world may have to come first. Can you imagine living for over 900 years? What kinds of surprises and excitement might you seek to help keep life fresh and interesting? I found his unmitigated delight at this turn of events frankly adorable. He's like a perpetual 5 year old... in all the best ways. Okay, so enough about the Doctor. 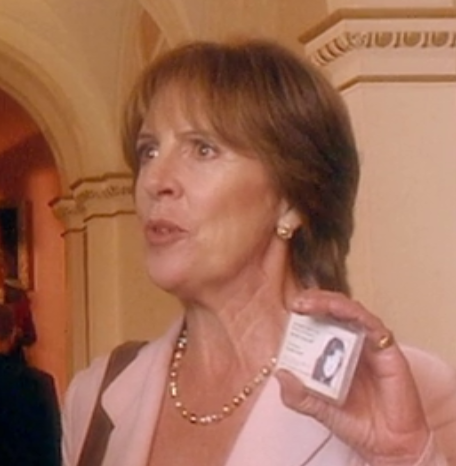 As much as I'm totally in love with Eccleston, I think one of the major lessons of this episode shines through the character of Harriet Jones. Even though Rose is new to all this alien nonsense, at least she's had a bit of time to adjust to her new world view. Harriet? She is just this regular, albeit persistent woman who gets smacked across the face with the changes. Does she go to pieces? Not even a little. She freaks just a bit, then accepts the way the world has transformed around her and moves on. In humanity, strength and leadership can show up in expected places. This storyline also showcase how easily humanity is manipulated and deceived. We hand the responsibility for protecting us to others, hoping all the while that they can handle the situation. How often throughout history have we abdicated our responsibility to those who have gone on to cause widespread destruction? To those whose motivations are selfish? We see what we expect to see, and we tell lies even to those we love to protect ourselves and our own desires. Yet we desperately need someone who knows our truth. 1) I get why the aliens were all disguised as large humans. Yet it still annoyed me. Extended fat joke? I'm sure there is another way they could have helped us know who were aliens in disguise without making every heavy person in the episode an evil alien. 2) While the farting made me chuckle for a while, it got a little overly silly. It's like on Family Guy when the joke goes on just a bit too long... and starts to become grating. Okay, I lied. Just a LITTLE bit more of the Doctor before I go. So he busts out into a room filled with armed soldiers and this is the look on his face. Then he manages to convince them to follow while he tries to save the world? Eccleston, you are the master. Doctor Who is amazing in the way it handles transitioning from super serious action to funny moments like this that bring out my inner 12 year old. Humor, horror, adventure, fart jokes... what's next?